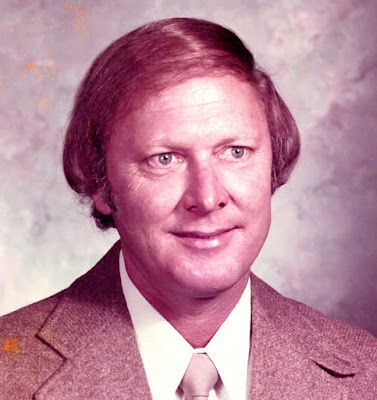 George Baxter Harris, 83, of Hickory, North Carolina, passed away October 1st, 2016, doing what he loved: piloting his Culver PQ-14A airplane. George was a graduate of UNC Chapel Hill with honors and a veteran of the United States Air Force. George was known for his wit and humor. When he walked into the room, the room would light up. Every time he was asked how he was, his reply was always, "Fantastic." The commercial pilot, who owned the airplane, was making a local personal flight from his home airport. During taxi for takeoff, the airplane experienced a total loss of engine power. The pilot/owner reported to a controller in the airport's air traffic control tower that he did not know why the engine stopped but that he got it restarted. The airplane subsequently departed. Minutes after departure, the pilot reported "engine problems" to the controller, asked to return, and was cleared to land on any runway. The airplane reversed course and witnesses near the accident site reported hearing the engine sputter and then stop. The airplane struck trees about 1 mile from the extended runway centerline as the pilot was attempting to reach the airport. Examination of the wreckage revealed no evidence of preimpact mechanical anomalies that would have prevented normal engine operation. The fuel drained from the airplane presented the color and odor of automobile gasoline, and the pilot was seen refueling his airplane from cans transported in his car. 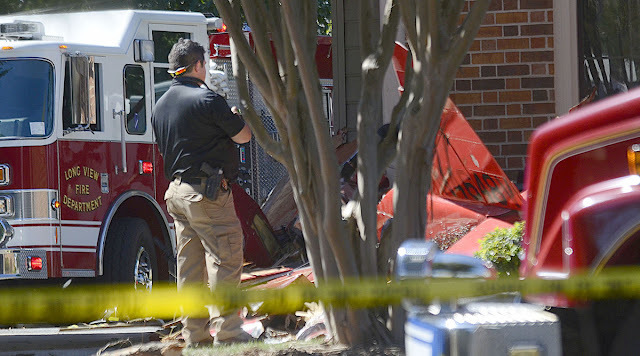 Further, the pilot had not serviced his airplane with aviation gasoline at his home airport. Atmospheric conditions were conducive to serious icing at descent power and moderate icing at cruise power. The airplane's loss of power when the power setting was low while taxiing and its loss of power when the power was reduced to cruise power after takeoff were both likely due to carburetor icing. A search of the airplane's maintenance records revealed no supplemental type certificate that authorized the use of automobile gasoline in the airplane, and the likelihood of carburetor icing is increased when automobile gasoline is used. While the airplane was equipped with carburetor heat, impact-related damage to the engine controls precluded an assessment of the control's preimpact position. The loss of engine power due to carburetor icing. Contributing to the accident was the pilot's use of automobile gasoline, which increased the likelihood of carburetor icing. 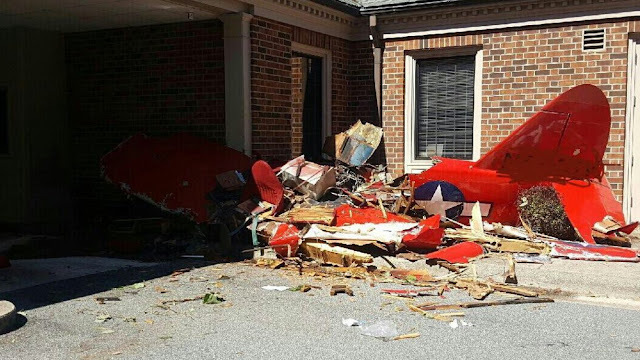 On October 1, 2016, at 1310 eastern daylight time, a Culver PQ-14A, N4648V, collided with trees, terrain, and a commercial building during a forced landing after takeoff from the Hickory Regional Airport (HKY), Hickory, North Carolina. The commercial pilot was fatally injured, and the airplane was destroyed. The airplane was registered to and operated by the pilot under the provisions of Title 14 Code of Federal Regulations Part 91. Visual meteorological conditions prevailed, and no flight plan was filed for the local personal flight. Information from witnesses and HKY air traffic control tower controllers revealed that the airplane's engine stopped producing power during taxi for takeoff. The pilot explained to the controller that he "didn't know why it quit," but that he got the engine restarted. The airplane then departed from runway 24. Shortly after takeoff, the pilot reported to the controller that he was "having engine problems" and announced his intention to return to HKY. The controller provided the altimeter setting, the wind information, and cleared the airplane to land on "any runway." Radar data revealed that the airplane was about 2 miles south of HKY when it reversed course in the direction of runway 01. The radar track ended near the accident site, which was about on the extended centerline of runway 01 and about 1 mile south of the approach end of the runway. Witnesses near the accident site described the engine sound as "sputtering" and "revving up and down." According to one witness, "I saw [the airplane] come over the hill, it was sputtering, and then it would rev back up. The airplane would climb a little when the engine ran, and then it would descend when it sputtered." The witness further stated that the airplane disappeared from view and the sounds of impact were heard. The pilot held a commercial pilot certificate with ratings for airplane single-engine land, multi-engine land, and instrument airplane. His most recent Federal Aviation Administration (FAA) third-class medical certificate was issued on October 2, 2014. He reported 2,462 total hours of flight experience on that date. A review of the pilot's logbook revealed that he had accumulated 2,478 total hours of flight experience at the time of the accident of which about 400 hours were in the accident airplane. He accrued 7.5 total hours of flight experience in the year before the accident of which 3.5 hours were in the accident airplane. According to FAA records, the airplane was manufactured in 1944. Examination of maintenance records revealed that the airplane's most recent annual inspection was completed on November 12, 2015, at 744.4 total aircraft hours. Differences between the airplane's fuel system and the fuel system schematic depicted in the airplane's maintenance and operating manuals could not be reconciled. According to the FAA Fuels Program Branch, a supplemental type certificate (STC) was required to use automobile gasoline in certificated aircraft and aircraft engines. An STC was available for the use of automobile gasoline in the Franklin 6A4-150-B3 engine that was installed in the airplane, but there was no STC for the Culver PQ-14A airplane. A review of the accident airplane's records found no STC recorded for the use of automobile gasoline. According to a line service technician employed by the fixed base operator (FBO) at HKY, he observed the pilot/owner servicing the accident airplane from 5-gallon cans. When asked if he had ever serviced the accident airplane with fuel, the technician stated he had never seen the airplane serviced at the FBO. At 1253, the weather reported at HKY included clear skies with 10 miles visibility. The wind was variable at 4 knots. The temperature was 23°C, the dewpoint was 11°C, and the altimeter setting was 30.09 inches of mercury. According to the New Carburetor Icing-Probability chart published by the Australian Transport Safety Bureau, atmospheric conditions were conducive to "serious icing at descent power" and "moderate icing at cruise power." Transport Canada has published TP 10737, "The Use of Automotive Gas (Mogas) in Aviation." Chapter 3.2 "Carburetor Icing," stated, "Mogas is generally higher in volatility than Avgas. Mogas will thus absorb more heat from the mixing air when vapourizing, resulting in ice accumulation at higher ambient temperatures. THE LIKELIHOOD OF CARB ICING WHILE FLYING ON MOGAS IS HIGHER." According to National Transportation Safety Board Safety Alert 29, "Engines that run on automobile gas may be more susceptible to carburetor icing than engines that run on Avgas." The wreckage was examined at the accident site on October 2, 2016. 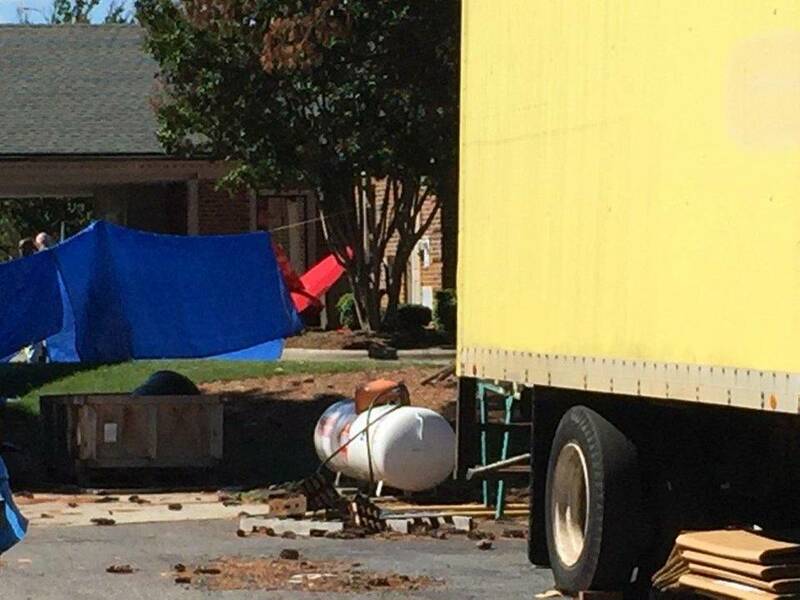 There was a strong odor of automobile gasoline, and all major components were accounted for at the scene. The wreckage path was oriented 359° magnetic and was about 100 ft in length. The initial impact point was in a tree about 35 ft above ground level, and ground scars were visible in the pavement about 25 ft before where the airplane came to rest against a building. The wreckage was divided into three main sections: the engine and instrument panel, the wings and cabin floor structure, and the empennage with a nearly intact tail section. All sections remained attached by cabling and wires. The preimpact position of the engine controls, including carburetor heat, could not be determined due to impact damage. Each wing contained three interconnected tanks that comprised the "main" fuel system. An auxiliary tank was also installed. All six tanks leaked fuel due to impact damage to the tanks and their connections. Continuity of the fuel lines was established from the tanks to the fuel selector, in-line auxiliary fuel pump, and the engine through several breaks. The fuel selector was in the "Main" position, and no blockages were found. All fuel drained from the airplane presented the odor and appearance of automobile gasoline. Control continuity was established from the cockpit area to all flight control surfaces. Sheet metal and cabling associated with the empennage, the horizontal and vertical stabilizers, and the elevators were identified. The propeller remained attached, and the blades were bent or fractured in an aft direction. The engine was separated from the wreckage, and impact damage was noted to the No. 5 cylinder and the crankcase. The engine was rotated by hand, and continuity was established through the powertrain and the valvetrain to the accessory section. Compression was confirmed using the thumb method. The engine could not be rotated through 360° due to a mechanical stop. The crankcase cover was removed, and damage to the crankcase was found that impinged upon the No. 5 cylinder and blocked the piston skirt, which stopped rotation. The internal engine components moved smoothly, were well lubricated, and showed no abnormal wear. The engine-driven fuel pump was removed, and it pumped fuel when actuated with a drill. The hand-driven auxiliary "wobble" pump was pumped fuel when actuated by hand. All fuel screens were absent of debris. The carburetor was disassembled, and the internal parts moved freely and were undamaged. The metal floats were intact. The carburetor bowl was absent of debris. The left magneto was removed, and, when actuated with a drill, it produced spark at all terminal leads. The right magneto was impact damaged, and the distributor was destroyed. The magneto drive was actuated with a drill, and spark was produced at the secondary output of the ignition coil. The Office of the Chief Medical Examiner, Raleigh, North Carolina, did not perform an autopsy on the pilot but completed an external examination. The probable cause of death was "multiple blunt force trauma." The FAA Bioaeronautical Sciences Research Laboratory, Oklahoma City, Oklahoma, performed toxicological testing on the pilot. Toxicological samples tested were negative for ethanol. Salicylate (aspirin) was detected in urine. On October 1, 2016, at 1310 eastern daylight time, a Culver PQ-14A, N4648V, was destroyed during collision with trees, terrain, and a commercial building during a forced landing after takeoff from Hickory Regional Airport (HKY), Hickory, North Carolina. The commercial pilot was fatally injured. Visual meteorological conditions prevailed, and no flight plan was filed for the personal flight conducted under the provisions of 14 Code of Federal Regulations Part 91. Preliminary information from witnesses and the HKY air traffic control tower revealed the airplane's engine stopped producing power during taxi for takeoff. The pilot explained the delay to the controller, the engine was restarted, and the airplane departed. Shortly after takeoff, the pilot reported the airplane was "having engine problems" and announced his intention to return to HKY. The controller provided the altimeter setting, the wind information, and cleared the airplane to land on "any runway." Preliminary radar data revealed the airplane was about 2 miles south of HKY, when it reversed course in the direction of runway 01. The radar track ended in the vicinity of the accident site, approximately on the extended centerline of runway 01, and 1mile south of the approach end of the runway. Witnesses on the ground described the engine sound as "sputtering" and "revving up and down." According to one witness, "I saw it come over the hill, it was sputtering, and then it would rev back up. The airplane would climb a little when the engine ran, and then it would descend when it sputtered." The airplane disappeared from view and the sounds of impact were heard. The pilot held a commercial pilot certificate with a rating for airplane single engine land, multiengine land, and instrument airplane. His most recent Federal Aviation Administration (FAA) third-class medical certificate was issued October 2, 2014. He declared 2,462 total hours of flight experience on that date. A review of the pilot's logbook revealed he had accumulated 2,478 total hours of flight experience, of which approximately 400 hours were in the accident airplane. He accrued 7.5 total hours of flight experience in the year previous to the accident, of which 3.5 hours were in the accident airplane. According to FAA records, the airplane was manufactured in 1944 and it was primarily a wood and fabric structure. It was powered by a Franklin six-cylinder engine. Examination of maintenance records revealed its most recent annual inspection was completed November 12, 2015, at 744.4 total airframe hours. At 1253, the weather reported at HKY included clear skies with 10 statute miles visibility. The wind was variable at 4 knots. The temperature was 23 degrees C, the dew point was 11 degrees C, and the altimeter setting was 30.09 inches of mercury. The wreckage was examined at the accident site on October 2, 2016. There was a strong odor of automotive gasoline, and all major components were accounted for at the scene. The wreckage path was oriented 359 degrees magnetic and was about 100 feet in length. The initial impact point was in a tree about 35 feet above ground level and ground scars were visible in the pavement about 25 feet prior to where the airplane came to rest against a building. The wreckage was fractured into three main sections; the engine and instrument panel, the wings and cabin floor structure, and the empennage with an intact tail section. All sections remained attached by cabling and wires. Each wing contained three interconnected tanks that comprised the "main" fuel system. An auxiliary fuel tank was also installed. All six fuel tanks leaked fuel due to impact damage to the tanks and their connections. Continuity of the fuel lines was established from the tanks to the fuel selector, through the in-line auxiliary fuel pump, to the engine through several breaks. The fuel selector was in the "Main" position, and no blockages were found. All fuel drained from the airplane were consistent in odor and appearance of automotive gasoline. Control continuity was established from the cockpit area to all flight control surfaces. The propeller remained attached, and the blades were bent or fractured in an aft direction. The engine was separated from the wreckage, and impact damage was noted to the No. 5 cylinder and the crankcase. The engine was rotated by hand, and continuity was established through the powertrain and the valvetrain to the accessory section. Compression was confirmed using the thumb method. The engine could not be rotated through 360 degrees due to a mechanical stop. The crankcase cover was removed, and damage to the crankcase impinged upon the No. 5 cylinder which blocked the piston skirt and stopped rotation of the crankshaft. The internal engine components moved smoothly, were well lubricated, and showed no abnormal wear. The engine-driven fuel pump was removed and pumped fuel when actuated with a drill. The hand-driven auxiliary "wobble" pump was actuated by hand and pumped fuel. All fuel screens were absent of debris. The carburetor was disassembled and the internal parts moved freely and were undamaged. The metal floats were intact. The carburetor bowl was absent of debris. The left magneto was removed, actuated with a drill, and spark was produced at all terminal leads. The right magneto was impact damaged and the distributor was destroyed. The right magneto drive was actuated with a drill, and spark was produced at the secondary output of the ignition coil.